Photo from Alaska Wildland Adventures on the Kenai River. Happy St. Patrick’s Day friends and fans of The Kenai, Alaska’s Playground! 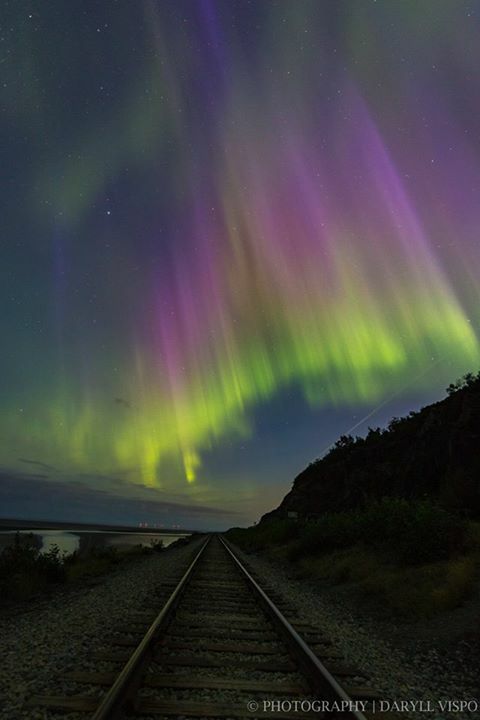 In honor of this lucky holiday, we are sharing ten gorgeous photos from the epic Kenai Peninsula that will leave you seeing green and falling in love. “Bear Backpack!” Photo from Kathleen Turner. #1. Zipling, Alaska’s Playground Style. Stoney Creek Canopy Adventures in Seward, Alaska. #2. When the phrase “take a hike” is always welcomed, you know you’re on The Kenai. Hideout Trail. Photo shared from http://www.trover.com. #3. When tundra and mountain biking collide, any outdoor enthusiast can agree that it feels a bit like you’ve discovered heaven on earth. Photo from Jon Langeland in Katmai National Park. #6. Seeing green from ear to ear means taking an aerial photograph overlooking The Kenai, Alaska’s Playground via flightseeing tour. EPIC. #7: A glacier surrounded by remote wilderness is our favorite kind of Alaskan party. #8. Mountains, just mountains. In all their glory. They say these things (just looking at them) are what get many hooked on Alaska. We can’t disagree. #9. 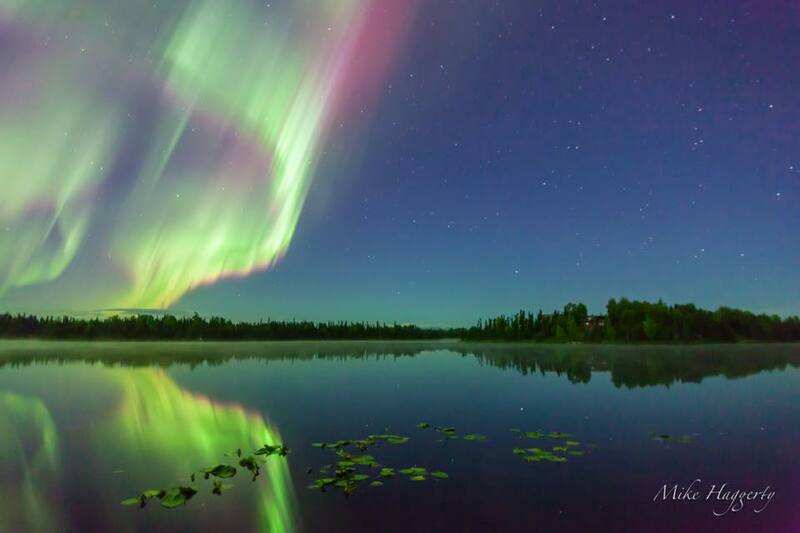 The Aurora Borealis dancing freely in the nighttime sky. Always a “pinch me” moment. Photo Credit: Ron Neibrugge with http://www.wildnatureimages.com. Taken in Seward, AK. #10. Fish on! 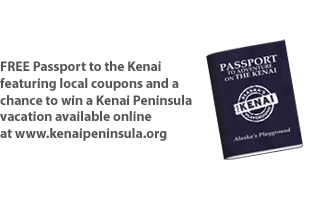 It’s hard to have a list about the Kenai Peninsula without including everyone’s favorite pastime. This is a great activity for enjoying long days with loved ones on Alaska’s Playground. Are you seeing green already? We know, we are too! Who would have ever thought that seeing green would feel this good. 😉 Wishing you all the Luck o’ the Irish this St. Patrick’s Day. Be safe out there and have a wonderful day! Oh what a month it has been! 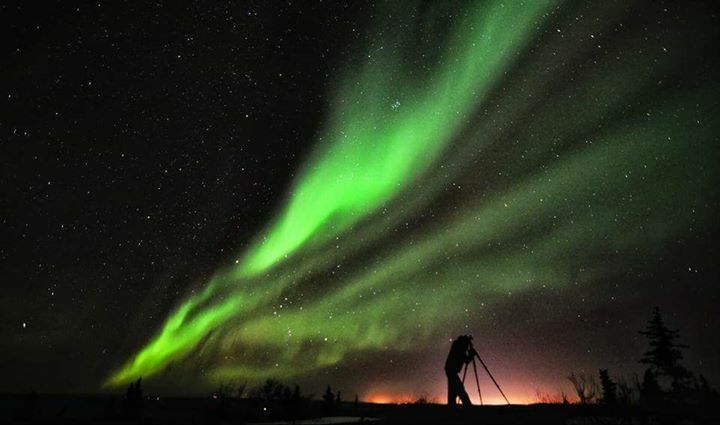 The Aurora Borealis (otherwise known as the Northern Lights) have been out in full swing and dancing the nights away in the Alaska’s Playground sky. Photo from Mark Pierson Photography‎ looking towards Kenai, AK across the Kenai River. Because it’s been such a bright and magical month on The Kenai, Alaska’s Playground, we decided to grab a collection of some of our favorite photos for all of our friends to experience along with us. 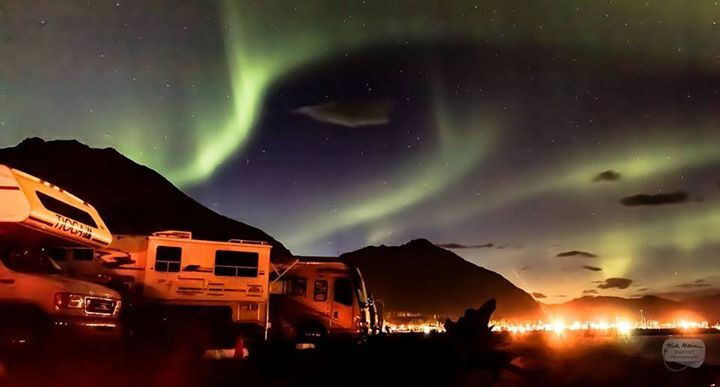 Campers in Seward, AK were treated to an amazing show. Photo from Kirk Alkire. These photos have been taken by amateur photographers and experienced photographers alike. 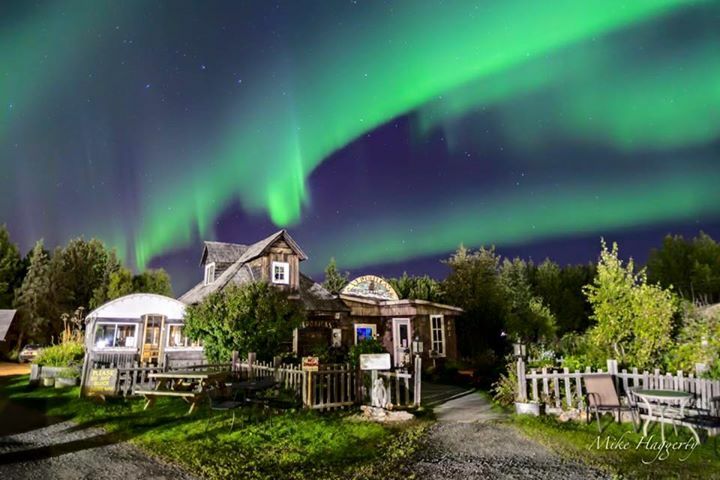 We have gathered most of this incredible photo content from our Facebook page as well as some other great pages including our friends at Alaska Magazine, Aurora Lovers, The Milepost, and many more. And we are also excited to share some really cool facts about Northern Lights from Live Science. Cooper Landing in the early morning hours. Photo from Timothy Sturm‎. 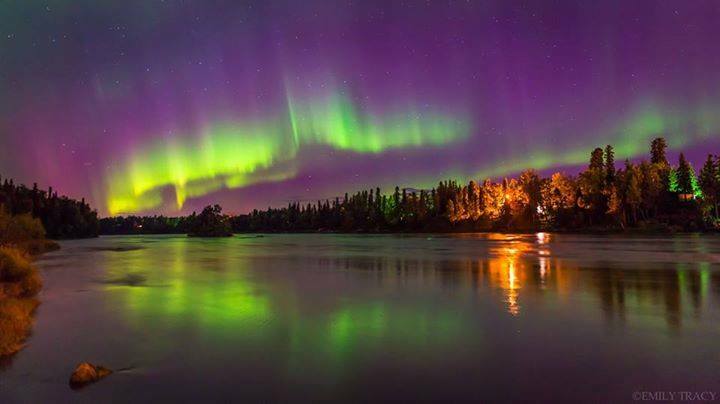 Aurora displays are created when protons and electrons stream out from the solar surface and slam into the Earth’s magnetic field. Since the particles are charged they move in spirals along the magnetic field lines, the protons in one direction and the electrons in the other. Those particles in turn hit the atmosphere. Since they follow the magnetic field lines, most of them enter the atmospheric gases in a ring around the magnetic poles, where the magnetic field lines come together. Photo from Matt Skinner‎, Lights Out Photography. Taken at 20 Mile River. 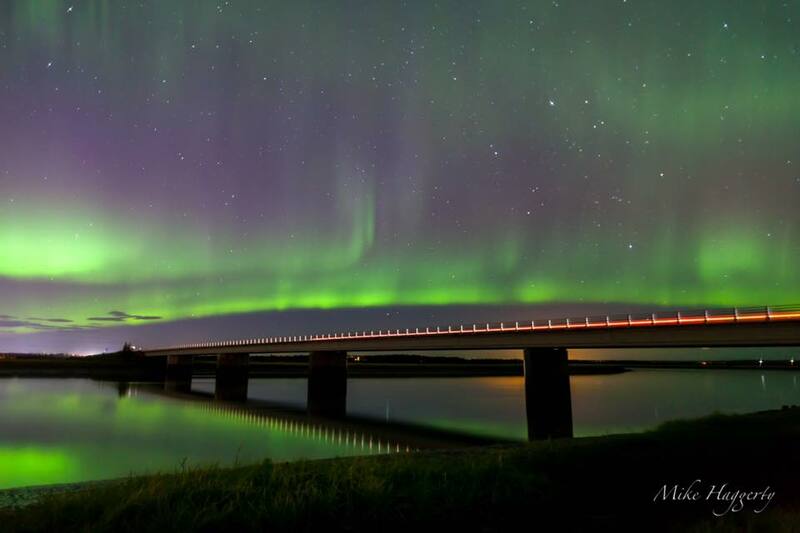 The air is made up largely of nitrogen and oxygen atoms, with oxygen becoming a bigger component at the altitudes auroras happen – starting about 60 miles up and going all the way up to 600 miles. When the charged particles hit them, they gain energy. Eventually they relax, giving up the energy and releasing photons of specific wavelengths. Oxygen atoms emit green and sometimes red light, while nitrogen is more orange or red. 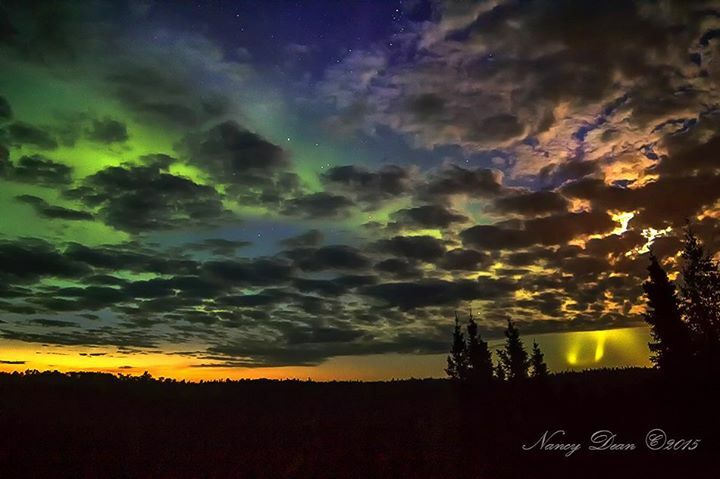 Photo from Nancy Dean‎ taken in Sterling, Alaska. Satellites can take pictures of the aurora from Earth’s orbit — and the images they get are pretty striking. In fact, auroras are bright enough that they show up strongly on the nightside of the Earth even if one were looking at them from another planet. Photo from Emily Tracy taken over the Kenai River. Occasionally the auroras are visible farther from the poles than usual. 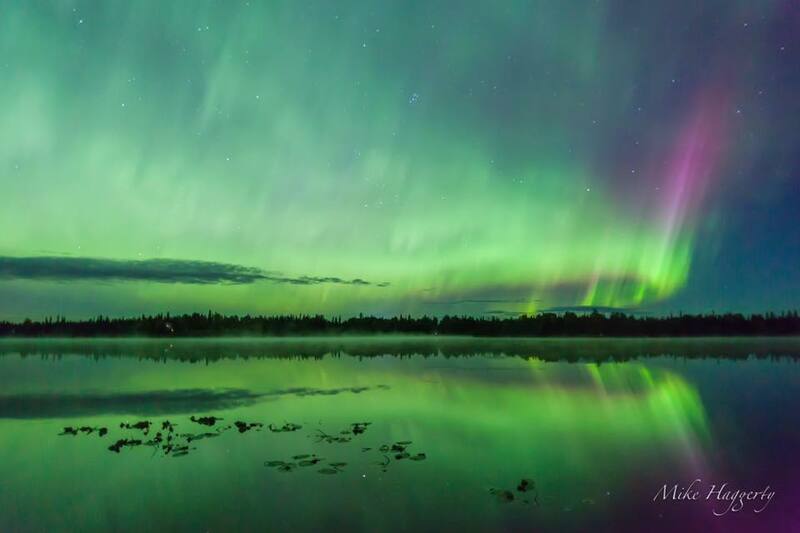 In times of high solar activity, the southern limit for seeing auroras can go as far south as Oklahoma and Atlanta — as it did in October 2011. A record was probably set at the Battle of Fredericksburg in Virginia in 1862, during the Civil War, when the northern lights appeared. Many soldiers noted it in their diaries. Photo from Christopher Morse‎ of an Army Veteran taking a few photos in his childhood town. The northern lights look like fire, but they wouldn’t feel like one. Even though the temperature of the upper atmosphere can reach thousands of degrees Fahrenheit, the heat is based on the average speed of the molecules. After all, that’s what temperature is. 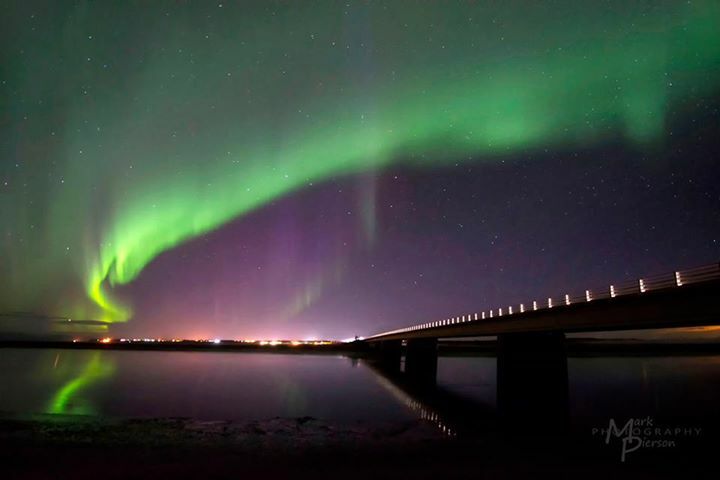 But feeling heat is another matter – the density of the air is so low at 60 miles (96 kilometers) up that a thermometer would register temperatures far below zero where aurora displays occur. Taken on the Seward Hwy. Photo from Matt Skinner with Lights Out Photography. 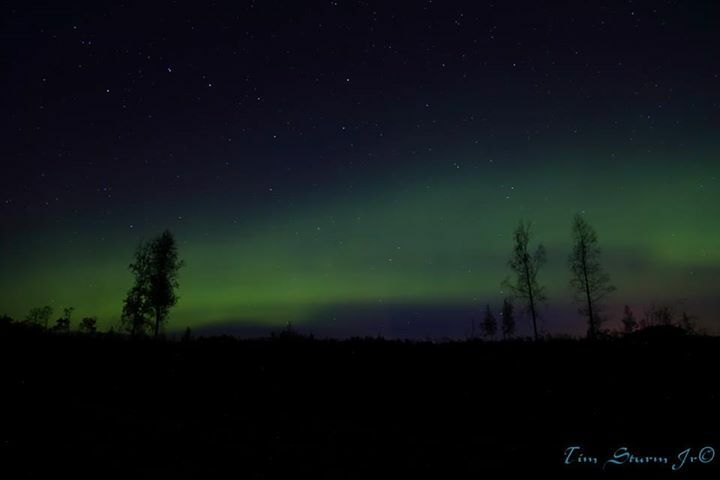 Auroras are relatively dim, and the redder light is often at the limit of what human retinas can pick up. Cameras, though, are often more sensitive, and with a long-exposure setting and a clear dark sky you can pick up some spectacular shots. One very important thing for our visitors to remember; you can’t ever predict a show! One of the most difficult problems in solar physics is knowing the shape of a magnetic field in a coronal mass ejection (CME), which is basically a huge blob of charged particles ejected from the sun. Such CMEs have their own magnetic fields. The problem is, it is nigh impossible to tell in what direction the CME field is pointing until it hits. 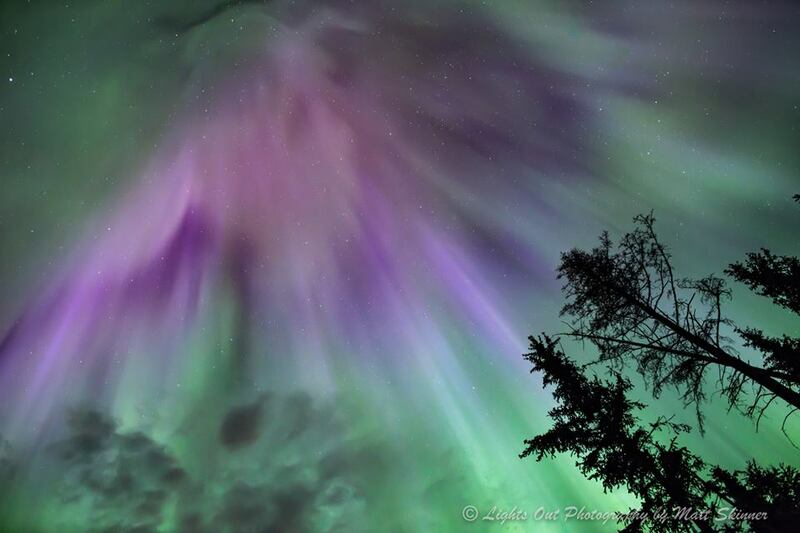 A hit creates either a spectacular magnetic storm and dazzling aurora with it, or a fizzle. Currently there’s no way to know ahead of time. Kenai River at the Warren Ames Bridge. Photo from Mike Haggerty. NOAA has an online map that can tell you what auroral activity looks likeon any given day, showing the extent of the “auroral oval” and where one is more likely to catch the lights. 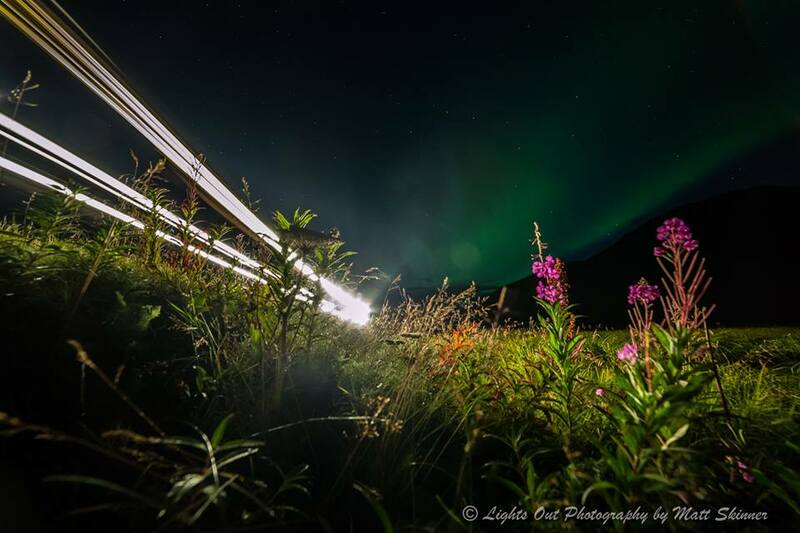 Photo from Daryll Vispo Photography‎ at the Turnagain Arm/Seward Hwy. It truly is so special to see these magical lights appearing in the middle of town, in the middle of the night, near some of our favorite local shops. Like this photo below at Veronica’s Cafe in the town of Kenai. Photo courtesy of Mike Haggerty. 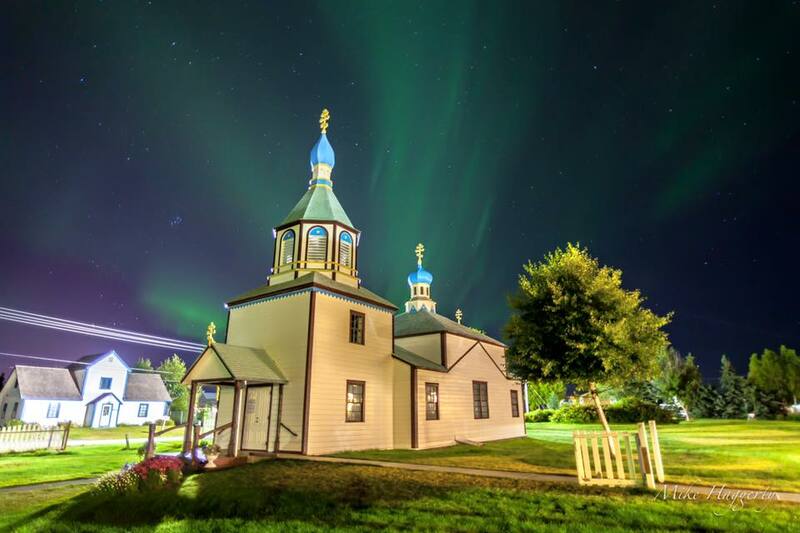 Here is another great shot from Mike Haggerrty at the Holy Assumption of the Virgin Mary Russian Orthodox Church in Old Town Kenai. Holy Assumption of the Virgin Mary Russian Orthodox Church. Photo from Mike Haggerty. 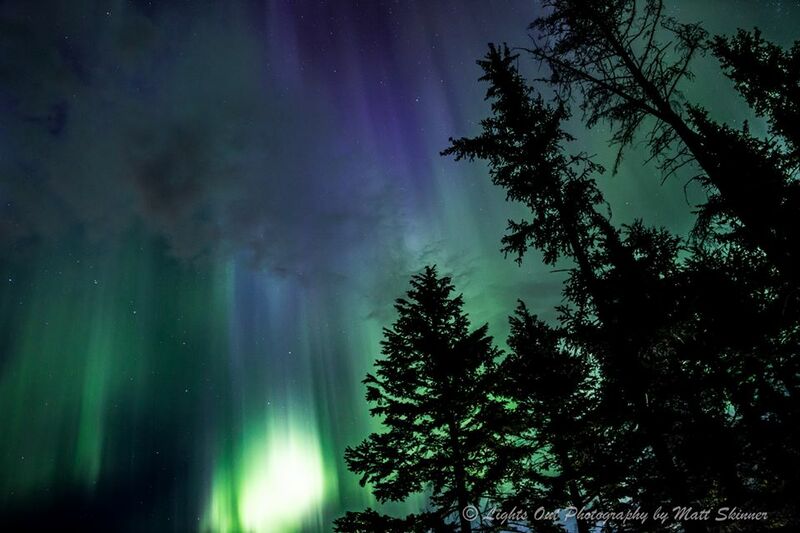 And an amazing shot down East Mackey Lake Road in our little town of Soldotna! East Mackey Lake Road, Soldotna AK. Photo from Mike Haggerty. Have you ever seen the Northern Lights? If not, be on the lookout! And if you capture your memories, be sure to share them with us HERE! Happy Friday, friends!